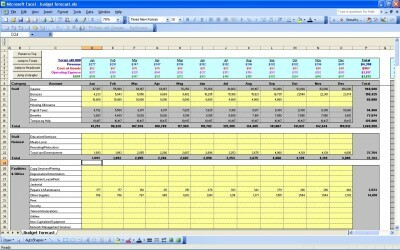 This spreadsheet is a very handy P&L statement and budget forecast tool. It’s a great choice for compiling a one-year statement based on revenue, expenses, cost of services and taxes. Download the here for free. This statement will help large or small businesses determine where opportunities for profit exist as well as areas where expenses can be trimmed to maximize profitability. This forecast spreadsheet will make it a breeze to compile yearly profit and loss statements and provide a well-rounded picture of where your business or venture lies. This template makes it easy for virtually anyone to track and calculate expenses. That aspect makes it a top choice for new businesses owners who may not have extensive accounting experience. By simply filling in the applicable fields, you can create an easy-to-understand P&L statement and budget forecast. Using your other financial reports can help make your profit and loss statement even more details, which can be an advantage if you plan on selling your business. You’ll be able to compare profits against common expenses, such as advertising, marketing and direct sales efforts. You’ll also be able to take into account tax spending as well as costs associated with maintenance and repairs. Why Download this P&L Statement Budget Forecast Spreadsheet? This spreadsheet can be used for any industry out there. Whether you are just starting your own small business or working with the finances of a multinational corporation – this is a great spreadsheet to use. Our profit and loss calculator is one of our most popular spreadsheets for a good reason: it makes complex financial structures easy to understand to create a good framework for increasing profits. Why Choose Us for the P&L Statement Budget Forecast Template? We are a leading provider of templates for all areas of business and personal tasks. We strive to produce and offer templates that are easy to use, free and available instantly. There’s no reason to spend money or labor over creating a spreadsheet from scratch when you can have access to hundreds of useful solutions. Download this p&l statement calculator and you’ll be ready to start using it in seconds. You’ll see why we are on of the most popular and trusted sites for virtually any template you can think of.